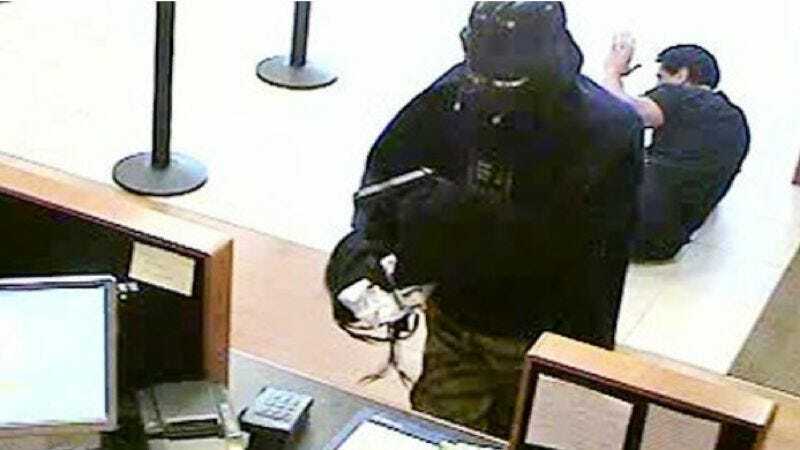 In a heroic bid to relieve the showbiz news cycle of tediously doled-out Comic-Con leaks, a guy dressed as Darth Vader robbed a Long Island bank yesterday, setting off a flurry of Star Wars riffs that should ease us into the weekend nicely. The New York Post got a head start, gleefully referring to the “Alderaan-sized wad of cash” he made off with, while noting that “at one point, the Vader invader kneeled as if speaking to the Emperor” before brandishing his very un-Vader-y gun at bank tellers, while also snickering that “cops found the fallen Jedi's lack of respect for the law disturbing.” Easy there, New York Post. Save some for the rest of us. All that joking around started early, as one of the customers apparently found the Sith-tuation so amusing (We wrote that! That one’s ours! Hooray!) that he “started joshing” with him, only to be shoved to the floor. Of course, it’s also possible that he was just amused by the robber’s incomplete getup, which featured the non-Lucasfilm-sanctioned additions of a blue cape and camouflage pants. The thief is currently still at large. Does David Prowse have an alibi?